It has been a real pleasure to be a part of preserving our nation's history through the restoration of structures around the country over the past 35 years. This month, we join thousands of organizations and individuals across America to recognize May as National Historic Preservation Month! 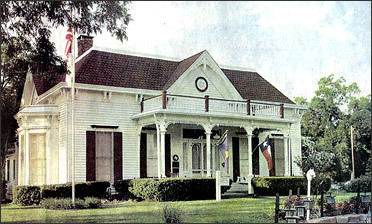 The Mathews-Powell House, pictured above, was dedicated as a Texas Historical Landmark in 1973 and was listed in the National Register of Historic Places on September 22, 1977. 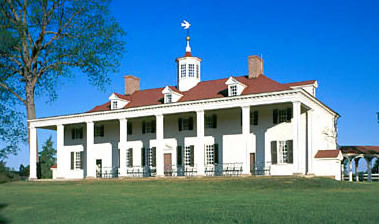 These historical registers exist today because of the National Historic Preservation Act of 1966, but the movement started as early as the 1850s when George Washington's home, Mount Vernon, was in shambles. Several pieces of legislation were passed from 1906 through 1935 to begin to protect the nation’s history and land, create the National Park Service, and write policy for preservation. In 1965, a report coordinated by Lady Bird Johnson (First Lady at the time), With Heritage So Rich, triggered public awareness and proposed the National Historic Preservation Act that was signed into law by President Lyndon B. Johnson on October 15, 1966. 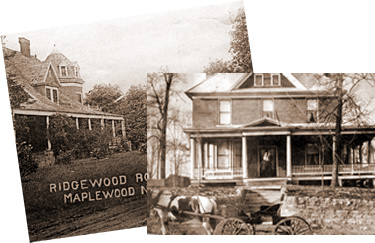 We have helped hundreds of thousands of folks preserve and restore their houses -- both those on historical registries dating back hundreds of years and those that were modernized in the past few decades. Our customers that own the two houses above were fortunate enough to have photos from 1909 (left) and 1907 of what the structures looked like soon after they were built. “There is a need in every generation to study the past, to absorb its spirit, to preserve its messages...it’s a collaboration of ourselves and our ancestors, the result is a deeper understanding for individuals and in consequence, a broader culture for the nation." "When we build, let us think that we build forever. Let it not be for present delight nor for our use alone. Let it be such work as our descendants will look upon with praise and thanksgiving in their hearts." A customer created this custom bench from our 3" Balusters and French Acorn Finials! This customer created a charming bed for his daughter using our Turned Porch Posts. We are thrilled to have been a part of the Powell's 18-month restoration on the Mathews-Powell House in Queen City, Texas. 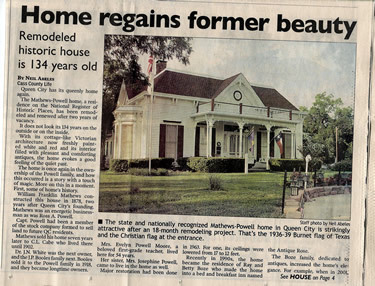 As the article says in their local paper, this historic "home regains former beauty." It was built in 1878 by William Franklin Mathews, and as mentioned above, is on both state and national historic registers. We applaud those who undertake restoration projects in celebration of the past! We also tip our hats to everyone who appreciates the traditional aspects of architecture and design because even a newly built home can embody and preserve the past through its traditional style and architectural details. Christopher J. Duerken et all., A Handbook on Historic Preservation Law, edited by Christopher J. Duerken (Washington D.C.: Conservation Foundation: National Center for Preservation Law, 1983), 1. Christopher Tunnard, ''Landmarks of Beauty,'' With Heritage So Rich, chaired by Albert Rains, directed by Laurence G. Henderson (New York: Random House, 1966), 30. Mitchell Schwarzer, ''Myths of Permanence and Transience in the Discourse on Historic Preservation in the United States,'' Journal of Architectural Education 48, no. 1 (September 1994): 3-4. Walter Muri Whitehall, ''The Right of Cities to be Beautiful,'' With Heritage So Rich, chaired by Albert Rains, directed by Laurence G. Henderson (New York: Random House, 1966), 49. Adina W. Kanefield, Federal Historic Preservation Case Law, 1966-1996, rev. ed.